In this blog post, we focus on step 2: how to Get Started. The Get Started stage is depicted below, including the different touchpoints along the way (for an explanation about the colors and icons used, please read the introductory blog post). After receiving the welcome email and their credentials, the partner is ready to get on board. If they applied for SAP PartnerEdge – Build, the full partnership, they can connect with the SAP Partner Service Advisor or Partner Manager who has been assigned to them. Their role is to help the partner navigate the SAP solution portfolio, and coordinate access to the many benefits in the program. They can also connect partners with experts from various SAP organizations, and keep partners informed of important SAP updates. Please note this high-touch benefit is not available for Open Ecosystem ­– Build members, as this program offering has a strict ‘no-touch’ approach. 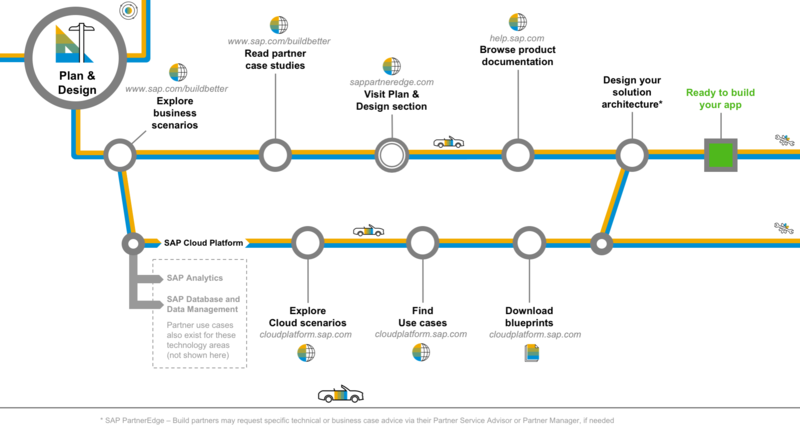 The SAP PartnerEdge Portal* is SAP’s key partner platform. Here, partners will find everything they need for a successful partnership, including access to all the information, tools and resources available within the SAP PartnerEdge program. Partners get access to this portal with the S-user ID. After logging in to the portal, a partner can personalize their profile* by subscribing to newsletters and choosing their areas of interest. On the SAP PartnerEdge portal we have created a specific “Build” area* under the “Development” tab. This Build area is constructed along the same stages of the ISV build journey which we also use in this series of blog posts. The first section is “Get Started” *, where the partner can download their Get Started Guide* which contains a lot of practical information about finding example use cases, ordering development licenses, and getting technical support. At all times during the journey, the partner can use the Manage My Partnership application* to maintain their partnership details, contact details, or solution lifecycle information. Manage My Users* is an SAP Fiori app which allows partners to add new contacts and maintain SAP user permissions for the employees in their company. Please note that only partner contacts with the role of ‘Partner Security Manager’ are able to access this app. With their profile set up and the correct contacts maintained, the partner is now able to order development licensing services. Let’s see how that works! Partners join the ‘Build’ engagement model to develop applications, so they need access to development software. As part of the Get Started stage, the partner can subscribe to development licensing services. Many on-premise development licenses are available for free; most cloud development services come with a charge. Development licensing services are offered through an SAP organization called “Partner Licensing Services” or “PLS” **. On the SAP PartnerEdge portal, there is a whole section about Partner Licensing Services*. It offers a clear step-by-step instruction how to order licenses. These steps are also shown here. Let me walk you through them! Before ordering, the partner may want to explore the portfolio* for technical details about available development licenses, which are delivered through subscription services. Partners can subscribe to on-premise or cloud licensing services to get access to the SAP technology required for building their application. Please note that development licenses also grant the partner test and demo rights. If desired, it is also possible to subscribe to test and demo licenses only, without development rights. In the Partner Price List* for Test, Demo and Development licenses, the partner can find the pricing for the different licensing options. The actual ordering of license subscriptions happens through SAP Fiori applications, which can either be accessed from the SAP PartnerEdge launchpad*, or directly from the SAP PartnerEdge portal. To be able to order licenses from PLS, a development license agreement is required. There are separate agreements for on-premise and for cloud. The first SAP Fiori application, called Manage My Agreements*, allows the partner to check whether this development license agreement is in place. If it isn’t, it can be requested from within the app as a click-through agreement. It’s also possible to see details about current agreements such as the start date, termination clause, and the partner contact who signed the agreement. The next step is ‘ordering’. The SAP Fiori app Manage My Services* allows the partner to order and manage on-premise as well as cloud services available under the SAP Partner Price List. This app allows the partner to submit a new order, follow the delivery of the order, and see order details such as pricing. If the requests for new agreements or new services have been submitted by partner contacts who do not have the role of ‘Partner Esigner’ assigned, these requests need to be approved by a Partner Esigner via the Manage My Approvals app*. Partner Esigners receive an email notification of pending requests. Now we’re at a junction, with different steps for on-premise and cloud. For on-premise software, it’s possible to create new technical installations from the Manage My Service app*, which is necessary to run SAP software. The partner will then need to visit the SAP ONE Support launchpad* to download and install the software and request a valid license key. For cloud services, the order in the Manage My Services app triggers a provisioning request for a development account on SAP Cloud Platform. The partner will be informed via email how to activate their account. 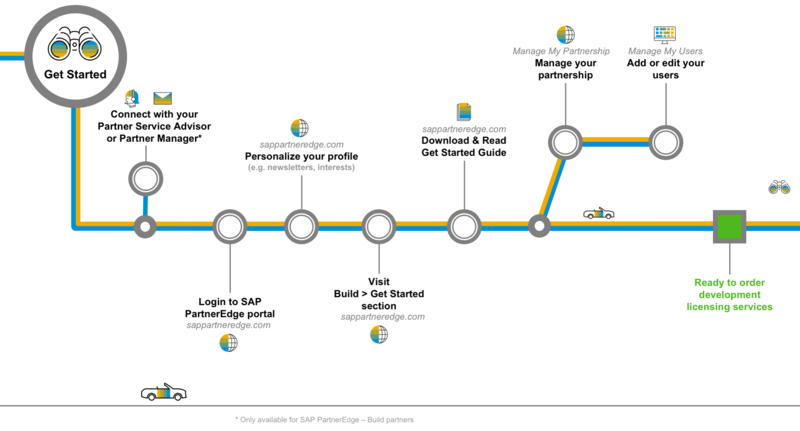 More details are described in a separate Get Access Guide*, which can be downloaded from the SAP PartnerEdge portal. After they have been informed their account is ready, the partner can visit the SAP Cloud Platform Cockpit* to access and activate their account. With these steps, the partner is now ready to start development of their application! In my next blog post, I’ll talk about the plan and design stage. Curious what that will look like? Here is a picture. I hope to see you back next week! Feel free to post comments or questions below, in case you have any. * Links in this blog posts marked with an asterisk indicate resources that are only accessible for members or partners of SAP PartnerEdge. An S-user ID is required to access. 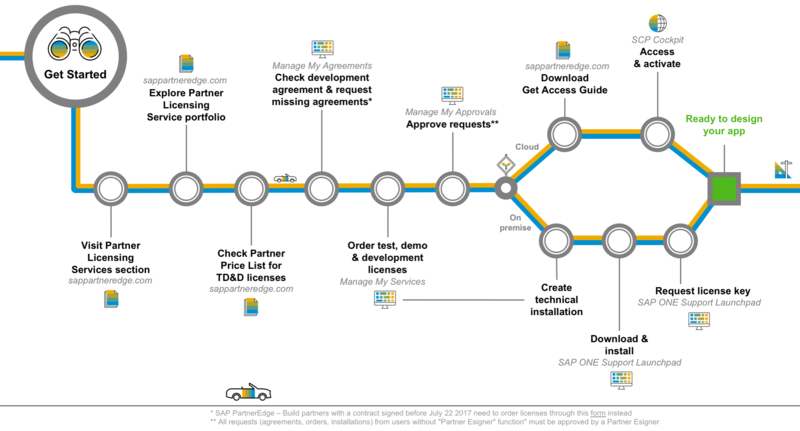 ** Please note: SAP Partneredge – Build partners with a contract signed before July 22, 2017 get development licensing services under their partnership contract. The journey in this picture is slightly different for them as they need to fill in a separate order form. This is not depicted on this slide. Members of Open Ecosystem – Build can follow the journey as shown here.